It's ecological mutation time, so get ready to head for the hills! They're coming! What is it this time, you ask? Grizzly bears? Alligators? Slugs? Would you believe bunnies?! "Hard to believe that a rabbit could be so destructive," announces a newscaster. Well, it's even harder to believe a paying audience wouldn't laugh themselves into a stupor at this plague of rabbits, since there's no way in hell to make the things look halfway annoyed, much less menacing! But that fact didn't stop these intrepid filmmakers, who wade into the patently ridiculous concept with a straight face and emerge with one of the silliest (non-Japanese) monster movies of all time... Rounding up a roster of solid B-movie regulars, Rory Calhoun plays a rancher who's sick and tired of rabbits eating up his acreage, so he calls on Stuart Whitman and Janet Leigh (as a pair of married zoologists) plus moustachioed science-guy DeForest Kelley (wearing ties so wide he could use 'em as a lobster bib). Instead of just poisoning the furry critters, they decide to try experimental hormones---and as everyone knows, when Science begins screwing with Mother Nature, the results can be catastrophic. And when Whitman's idiot daughter releases one of the mutant test bunnies, the entire county is soon faced with (are you sitting down, folks?) a rampaging army of five-foot-tall, 150 pound, carnivorous rabbits! 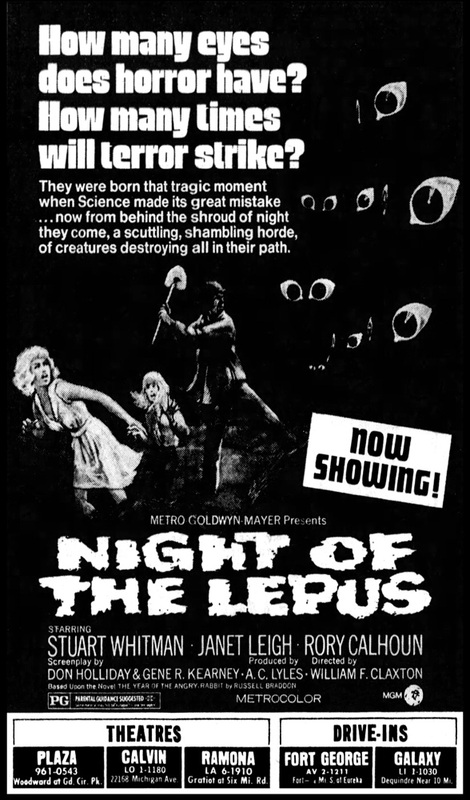 The first third of the film is kept low-key and pseudo-serious by director William F. Claxton, but once the giant rabbits begin gnawing on the population, it's never the same. But you probably won't care, because you'll be laughing so damned hard. A better title might've been 'Bloody Bunnies on Parade'! They lumber across the countryside in slow motion on a quest for flesh, with close-ups of their monstrous buck teeth and kill-crazy pink eyes keeping the chuckles at an all-time high. And wait until you see how they flip end-over-end and gush gore when they're shotgunned. Elmer Fudd, eat your heart out! 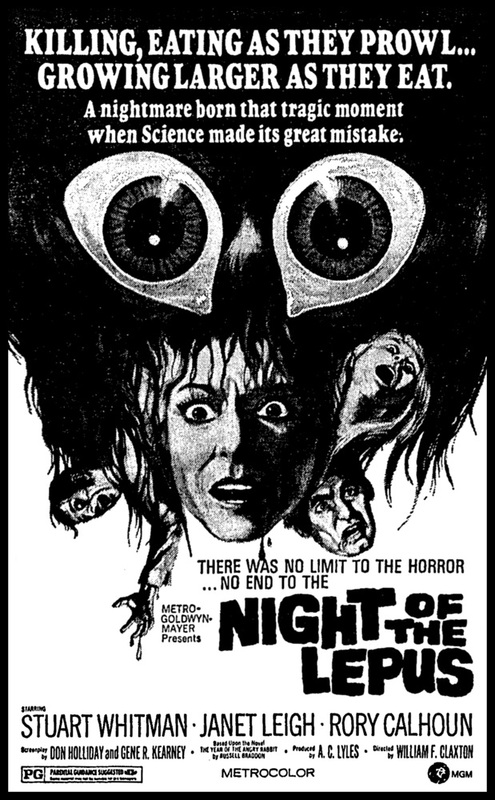 When they invade the obviously-miniature town, it's utterly hare-raising (sorry, I couldn't help myself), and as far as furry frights go, I've gotten more shudders from Burt Reynolds' toupees... The filmmaking is slick and surprisingly bloodthirsty, and for some unexplainable reason the actors don't even seem too embarrassed to be associated with this nutty feature. DeForest Kelley comes off best of all, since he was simply glad to get a hiatus from Shatner and all the other Trek twits. 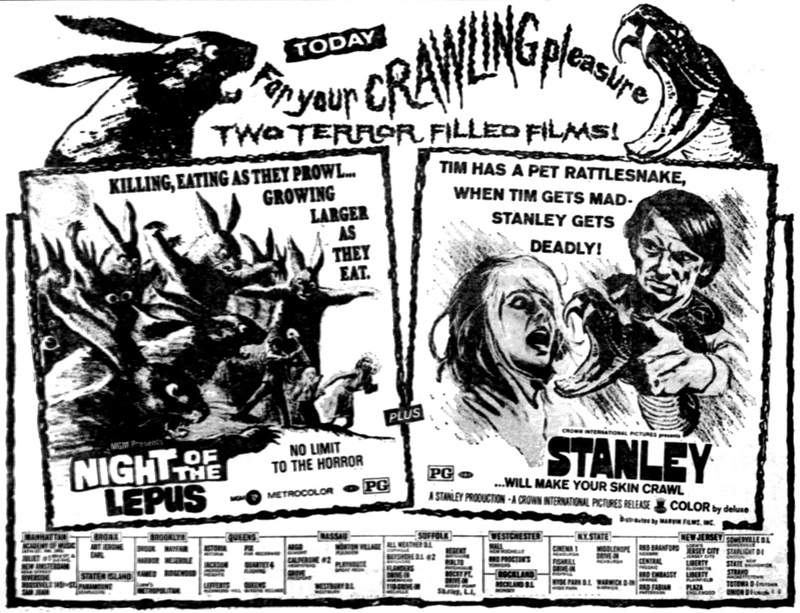 Fast-paced and indescribably dumb---it's perfect for an Easter Family Matinee, as well as a must-see for mutant monster aficionados... Based on (believe it or not) a novel called The Year of the Angry Rabbit.